Dominick and I have our assistant Christie to thank for collecting 180 data points to help our clients visualize the difference in solar energy production depending on the tilt angle and the orientation (north, south, east, west) of solar panels. The chart below shows how much energy a 1 kilowatt solar panel array would produce annually along the vertical axis. Each line shows a different roof pitch (angle). 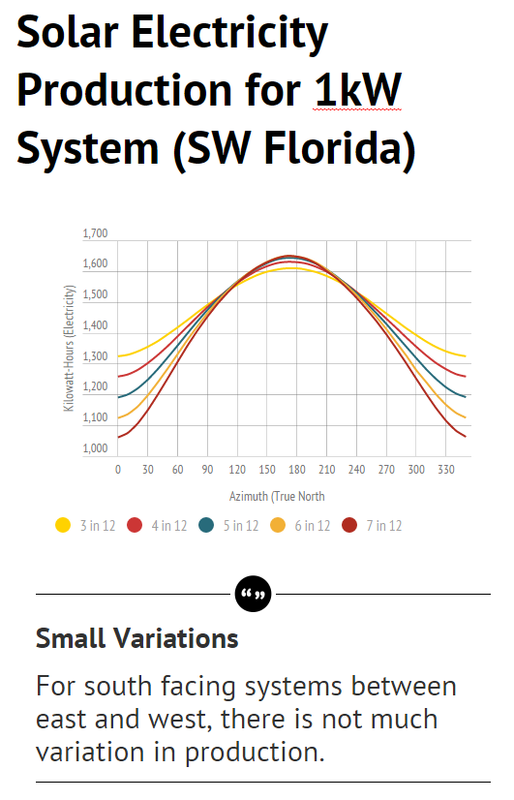 Roofs in Southwest Florida generally vary from 3-in-12 (14º) to 7-in-12 (30º). Along the horizontal axis we show all of the ways solar panels can face with 0º being true north, 90º east, 180º south, and 270º west. The best production from any roof pitch comes around 170º (just slightly east of due south). Conventional wisdom tells us that due south is best, but in Southwest Florida we get routine afternoon clouds and rain throughout the summer, so production from the west sky is less than the relatively clear east sky. Cooler morning temperatures also help photovoltaic panels generate more energy, so morning production is further improved. This accounts for the reason that an orientation slightly east of true south is ideal. The production levels from systems facing southeast (135º) and southwest (225º) are essentially identical regardless of roof pitch. Once you start to move north of east or west, the difference starts to become apparent very quickly, with steeper roofs losing production very quickly. For existing homes we are stuck with whatever pitch and orientation the roof has, but we can select the right roof with confidence knowing what the varying production levels are for any vertical and horizontal angle. For a more detailed analysis of your specific location, try out PV Wizard. These values were derived from the National Renewable Energy Labs’ PVWATTS v5 calculator in June 2015, and takes into account the weather and a variety of other assumptions that were kept consistent in determining the annual energy production for each pitch and azimuth.